Soy Toilet Scrub 32 oz (case of 12)  : Welcome to Sheepish Distribution!, All Natural Care Products! 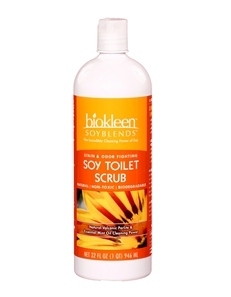 Biokleen Soy Toilet Scrub is gentle while the acid-free formula effectively cleans, and deodorizes tough stains and odors. Made with Soybean Oil Extract, Natural Volcanic Perlite, and Grapefruit Seed Extract, Biokleen Soy Toilet Scrub provides for a natural, non-toxic, and effective alternative.